Hey guys, Syon here. Release is right around the corner, so we figured we may as well come up here and give a few a few updates on how things are progressing. Editing is just about done. Realistically, most of it should be done within the next few days or so, with one or two being put on hold until we have the CGs for it. Consistency and all that. But otherwise, we’re finished with it, guys. We’ve put a lot of work into this stage of the writing process, so we really hope that HB is a pleasant and memorable reading experience. On the art front, sprites are completely done! Everyone has their outfits, everyone’s all colored in, and I think most everyone has been identified in the build. Big thanks to Shiyun and Myuto for all their work on drawing and coloring the sprites. They really helped bring our fun, little cast to life. Furthermore, Katz (one of our wonderful artists working on the Human Reignition Project) did some coloring work for the 18+ version, so we’d like to extend a special thanks to her. The amount of characters in Highway Blossoms is relatively small, with the Trio being the only recurring side characters. Still, here’s a glimpse at a few of our one off minor characters! Howard. His wife is around here somewhere. CGs are on the verge of being complete. Most have been lined and are in the process of being colored, while the others should be flooding in over the course of the next few weeks. Send your good vibes to Shiyun, Rosuuri, and Weee as they finish the last of their work. The soundtrack is pretty much done. We’re only waiting on one track and that should be done at anytime. For the size and length of the game, it’s pretty big. I think you guys are really gonna dig it. We plan to a sell a digital copy of it on Steam, so look forward to that as well. Speaking of Steam, expect achievements and cards for those of you who are into that. Programming is coming along as well. Kevin is making wonderful use of Ren’py, the fault milestone 3D camera engine (eternal gratitude to Alice in Dissonance) and our beautiful art. Josh and I recently went through the build and assigned most of the CGs to their proper places, and similarly, I’ll be doing the same thing with music very soon. Overall, I feel very confident in saying that Highway Blossoms is on track to be released later this month or sometime in June. But before I go, I just wanted to show off some neat things Myuto has made recently. 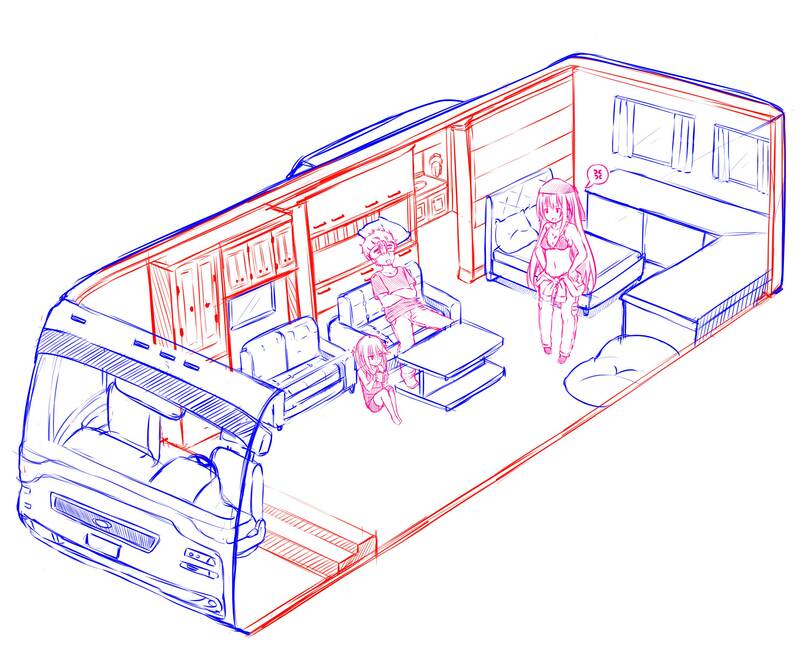 The first of which, is a cutaway of the Trio’s super secret and totally street legal motorhome. Secondly–and this one hearkens back to our last update–are roughs of keychains we’d really like to release, these being of the Trio. We can’t say for sure if the keychains will be a thing, but we’d love to make it happen! A lot of it will rely on the interest HB receives upon release, and of course, you guys.